Kim Hollis: The Purge: Anarchy, the quick sequel to last year's breakout horror hit, earned $29.1 million this weekend in its debut. What do you think of this result? Matthew Huntley: This is a great result for a movie that only cost $9 million to produce (and probably not more than $20 million to market), so the studio should definitely end up in the black on this one. However, this tune has been played before, whereby a low-budget horror movie opens to stellar numbers and then completely collapses in the weeks ahead. I see no reason why The Purge: Anarchy will be any different, but at least Universal gets to call it a success. Due to these figures, we can expect at least one more theatrical release in this franchise, followed then (probably) by direct-to-DVD sequels. Edwin Davies: I also think this is a great result, less because of the number itself - which is still very impressive in terms of the budget - than how it compares to the opening weekend of the first film. 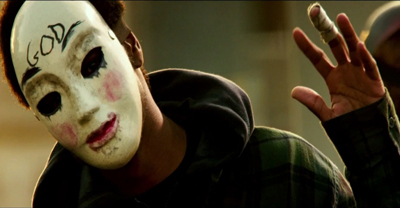 The first Purge had a solid high concept premise that it did nothing with, teasing audiences with the promise of an America overrun by lawlessness then delivering a fairly standard home invasion thriller. There's definitely a sense that Anarchy was the film that people wanted the first film to be (and may even be the film that James DeMonaco wanted to make last year, but felt he needed to make a cheaper proof of concept first) and the ads did a great job of putting that idea across. Considering how poisonous the response to the first film was, retaining such a high proportion of the audience was a major success in and of itself. The word-of-mouth and reviews are stronger this time around, so there's a chance that it ultimately outgrosses its predecessor, but whether it does or not it'll be another ludicrously profitable entry in this nascent franchise.